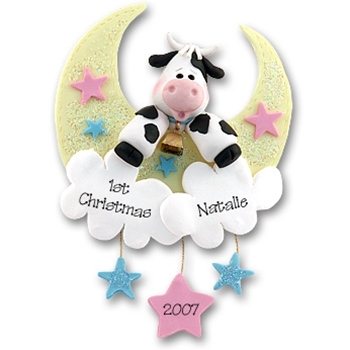 ...And the cow jumped over the moon...proving some things in life are always in style! This classic design is perfect for the new boy or girl in your life! Done in pastel colors to work in any nursery decor with just enough glitter to catch your eye. It comes complete with a hook and satin ribbon for hanging. Handmade from polymer clay and designed by Debi Allison. THIS ORNAMENT DOES NOT HAVE "1ST CHRISTMAS" ON IT. YOU MUST PUT IT IN THE INSTRUCTIONS BOX IF YOU WANT THAT ON YOUR ORNAMENT. Name or Message - Left Cloud: Example "1st Christmas" "Matthew's 1st Christmas" etc. Name or Message - Right Cloud: Example "1st Christmas" "Matthew's 1st Christmas" etc.